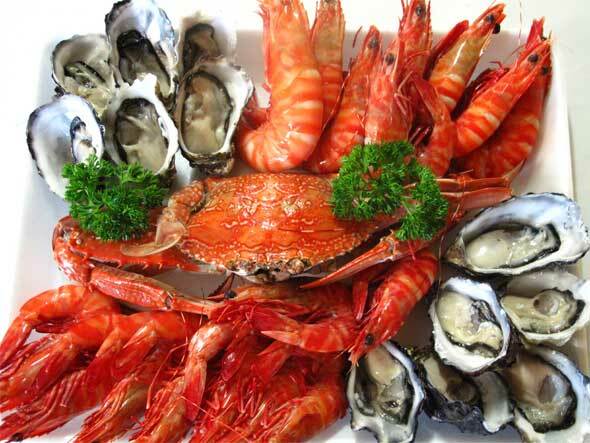 Sea food is very rich source of protein as well as other nutrients and even low in fat. So it is very good for pregnant women. There are some benefits as well as disadvantages of taking seafood. Some fish will contain high level of mercury called methyl mercury which will harm an unborn child’s developing nervous system in case it is eaten regularly by the pregnant women. Mercury will be released into the environment through industrial pollution and accumulated into the surface of water as well as oceans. Bacteria which are present in the water will cause some chemical changes in the water which will convert mercury into methyl mercury which proves to be very dangerous. Fish will absorb the methyl mercury from water as they eat aquatic organisms. Almost all fishes contain some amount of methyl mercury which is not very harmful to the human beings. Big fishes are more dangerous for the human beings as they eat small fishes so they will contain large amount of methyl mercury present in it. So, pregnant women can protect their unborn child by not eating these large fishes. Some of the large fishes are shark, swordfish, tilefish etc. Even small children as well as nursing mothers should avoid eating the larger fish. There are varieties of fishes which pregnant women can eat which will prove to be healthy. Depending on the serving size one can eat fish more frequently. Some of the healthy fishes are canned fish, shellfish or farm–raised fish. In one week you can eat more than 12 ounces of fish and it provides you no harm. One can get all the information regarding whether the fish is sold in your local area by contacting the food safety authority or local health department. Intake of fish is very unsafe for you and your family because there is lot of risk of contamination from mercury in water .The mercury contamination is possible through natural sources or may be through some industrial pollution. Approximately there are 35,000 fish farms in 23 states and it is according to the statistical record. The most popular seafood product is catfish. Mississippi is the largest producer of the catfish. Majority of the fish which Americans are eating are through man-made aqua farms. Catfish being ugly is also a scavenger. There is inbuilt cycle present in the catfish which will help to clean all the toxins from its body which it will consume from the environment. Mercury proves to be very dangerous toxic metal which can damage the whole nervous system of the small children and even the unborn child .On the other hand elder people will experience headaches, numbness in hands as well as feet, poor concentration power etc. Through research studies it is suggested that the men is more prone to heart attack if consumed lots of sea food. According to the investigation done by the tribune governments as well as seafood industry are not caring for the public health. Through various industrial processes mercury is released into the air as a bi-product and from there it will accumulate into lakes, oceans etc.